Charles Kwasi Asampong Taylor left for Qatar via Amsterdam, yesterday, by KLM . The Kumasi Asante kotoko striker will be hooked to a Dubai club, Al Khaleej Sports and Cultural Club, on a three-month probation A source close to the Kotoko, stated that Kotoko is expecting nothing less than $350,000 (¢3.150b)transfer fee from the Dubai club. This, the source said, was in view of the various offers which had been made by other interested clubs, with Ghanaian-born Freddy Adu's American Major League side, DC United, for instance, proposing between $400,000 and $450,000. Taylor is however expected back in Ghana on Wednsday to help kotoko lift the confederation cup. Kotoko To Miss Taylor? Graphic -- Kumasi Asante Kotoko's dare devil player Charles Taylor is likely to miss the titanic CAF Confederation Cup final against Hearts of Oak.The player had jetted out of the country to oil-rich Qatar to conclude arrangements for his transfer to a division one side in that country. Taylor whose two-year contract with Kotoko runs out after this season has been embroiled in a long search for a foreign contract since his days with Hearts of Oak. This is, therefore, an opportunity for him to achieve his heart's desire having played his role on the local scene with brilliance.Major (Rtd) Yaw Larson, the CEO of Kotoko confirming Taylor's journey to Qatar in a telephone interview with the Graphic Sports, said managment had given him the blessing for the trip. He was, however, hopeful that Taylor would be back for the Confederation Cup final matches against Hearts. Major Larson said arrangements have been made with the Qatari side for the release of the player for the final matches. Admitting that the player's presence was crucial for victory over Hearts, Major Larson was, however, confident that in the event of the player unable to make it, Kotoko had the wherewithal to take care of Hearts of Oak. 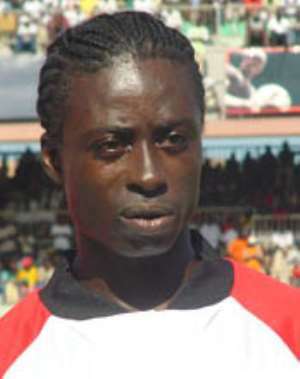 Taylor, whose transfer from Hearts to Kotoko sparked off a bitter transfer feud between the two giants, has played a key role in Kotoko's success story this year in both the GT Premier League and the Confederation Cup. His influence on matches has always been phenomenal and his absence in the final match could be a blow to Kotoko. Many believe if he returns for the final match, it would afford him the opportunity to pay back his former team following the problems he went through before signing for Kotoko. Meanwhile, Kotoko are gearing up for the big match on November 28 in Accra. Major Larson says the team is being motivated to go into the match with all seriousness and make history for themselves and the nation. They have no injury problems so far and none of the players is facing any ban.